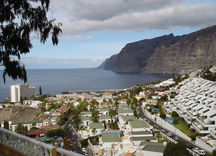 Los Gigantes is located on the south west coast of Tenerife and is only a short distance from another two holiday resorts Puerto de Santiago and Playa de la Arena. Situated in the municipality of Santiago del Teide, Los Gigantes can be found just south of the famous "Acantilados de Los Gigantes" , and about 30 kilometres from Playa de Las Americas and Los Cristianos. It is generally acknowledged that the year-round climate in this region is among the best in the World. 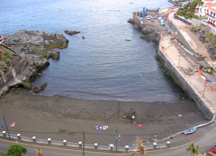 Los Gigantes, Puerto de Santiago and Playa de la Arena are small quiet villages . However there are still many places that have live music tribute acts etc. 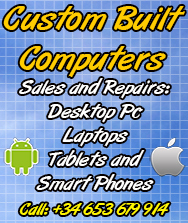 Whatever your tastes, you can be sure that you´ll find something to suit your needs. 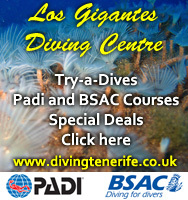 The village of Los Gigantes is situated at the foot of the 500 metre high cliffs which gives it its name. The cliffs also mark the southern boundary of the beautiful Teno mountains. The cliffs are visible in all their glory from the Archipenque Mirador viewing point, just above the village. They can be experienced from the sea up close, where they loom over you, and you are able to distinguish the different colours and textures of the volcanic rock. Los Gigantes is a very pretty resort. Great care has been taken over its design and construction. With the exception of one multi-storey hotel, all of the resort´s central apartment complexes and residential areas are low-rise and blend in well with the surroundings. It is a small, tranquil place and has an air of exclusivity about it. There is not much danger of the resort losing this atmosphere and ambience by expansion in any direction, closed in as it is, on all sides, nestling between the area´s natural rocky confines and the Atlantic Ocean. 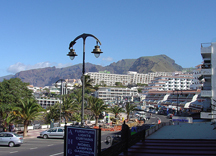 Life revolves around the Marina, The Plaza and the Avenida Maritima main street .The roads in Los Gigantes are very narrow; with a one-way system operating throughout most of the village. For an aerobics workout try walking up "Cardiac Hill". Los Guios is a small, clean, black sand beach which is rarely crowded, despite being suitable for children. Parking around the beach/marina area can however be a problem. Next to the public beach is the marina, where you will can find an array of bars and restaurants overlooking the boats and the neighboring island of La Gomera. Here you can book scuba diving, or a trip to see bottle nosed dolphins and whales, fishing trips, jet ski, a kayak trip, rent a boat and sailing. 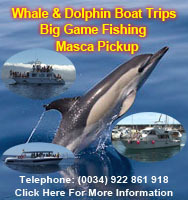 The boats that pick hikers up from Masca Bay, after the walk down the barranco, depart from here as well. The Plaza is pedestrianised and based around the church. 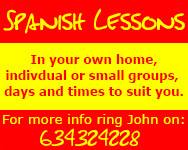 The majority of events such as the carnival de Los Gigantes (the week after Ash Wednesday) take place there. There is also a small tourist information kiosk on the roundabout heading down the hill towards the marina. There are several pool complexes El Laguillo, with large bathing area, snack bar and natural pool. Oasis club has a pool with water slides, lawns and bar/restaurant. There is also a walk down to the rocks and sea. Crab Island has a natural pool filled regularly by the sea waves. Tipsy Terrace has a swimming pool, lawns, tennis courts, mini golf course a restaurant and a bar. 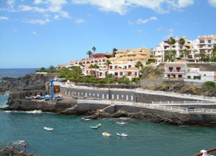 Directly south of Los Gigantes is the old fishing village of Puerto Santiago, which despite extensive development, still retains an unhurried, homely atmosphere. 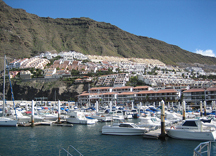 Puerto de Santiago lies between Playa de la Arena and Los Gigantes. It is on the coastal road, which links the villages. It has a small fishing port and beach. There are top, middle and bottom parts to the town, making the area rather sprawling. It is a mixture of homes, hotels and apartments. As you would expect from a tourist resort, there is an assortment or bars, shops, restaurants, a post office, and nightlife. As there are a large number of local residents in the area you´ll find some excellent Canarian food available in the traditional restaurants and tapas bars. The medical centre is next to the small plaza .The annual firework display during the fiesta in July is always spectacular. 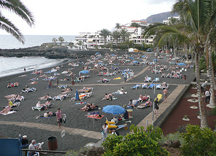 Further south, and almost joined on to Puerto Santiago, is the growing resort of Playa de la Arena. (Sandy Beach). Unimaginatively named, it does boast the best beach in the region. It has been awarded the European blue flag of excellence for many years in succession. Although small, it can confidently stand comparison with any other beach of similar size on the island. This is especially true when you consider that while many of Tenerife´s popular beaches are man-made using imported sand, from the Sahara desert, the beach here is natural. 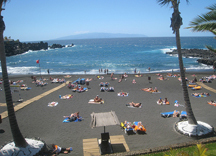 Its black sand is a constant reminder of the island´s powerful volcanic origins. The beach is situated centrally along the main coastal thoroughfare, the Avenida Maritima, which has relatively easy free parking. If you get hungry or develop a thirst you will find yourself spoilt for choice by the many bars, restaurants and shops adjacent to and opposite the beach. For a relatively small resort, Playa de la Arena boasts a large selection of bars and restaurants, although ´nightlife´ in the sense of clubs and discos, while it undoubtedly exists, is on a much smaller scale than the larger resorts in the south. The Tourist Information office here has staff who speak English. 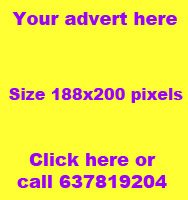 They are very helpful and can give you on-the-spot information, plus there is always a multitude of leaflets and pamphlets freely available, which will give you, further facts and figures about the region. 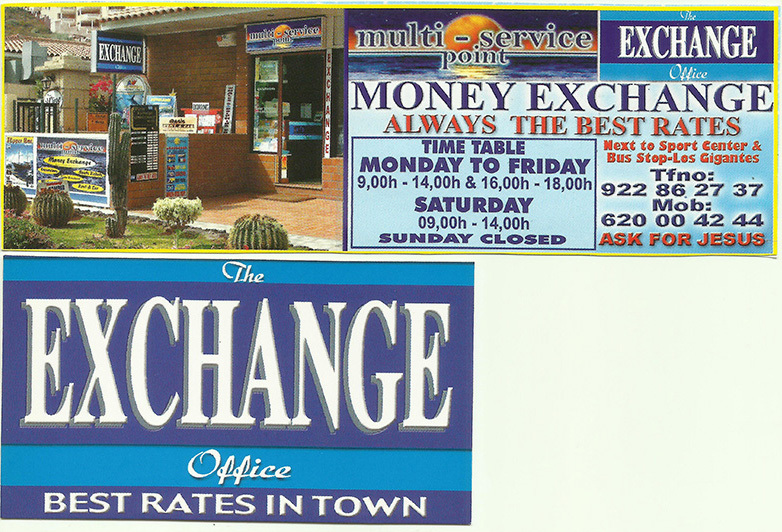 Santiago del Teide council office is next to the tourist office. Don´t forget that being a small island in the Atlantic Ocean, Tenerife is sometimes subject to rough seas, especially during the winter. Occasionally when weather conditions prohibit bathing, a red flag is flown on the beach. 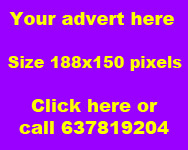 Please don´t ignore it!